I call this piece “Split the Heart.” I created it as a tribute to the Summer of Love, this year being its 50th anniversary. In this drawing I wanted to capture the feeling of what it might have felt like to be a woman during that summer of flower children and sexual exploration. If I had been alive in 1967, I definitely would’ve hung out in San Francisco all summer. It would’ve been sick –or should I say groovy? This piece will be showing in San Francisco at Arc Gallery’s upcoming “Summer of Love” exhibition which opened in May of 2017. A few weeks ago I clipped this photo out of a magazine of a girl doing a backbend and I drew it in my sketchbook. I loved the pose, but I didn’t yet have a vision of how to turn it into a full-fledged art piece. I do this a lot: whenever I like an image in a magazine, I’ll tear it out, draw it, then let it ruminate in the back of my mind until inspiration comes along. So when I heard it was the 50th anniversary of the Summer of Love, this sketch immediately came to mind. This yoga pose is called tadasana (with a backbend). In today’s world I feel like I the people who practice yoga are a bit like modern day hippies. Yes, I know –totally not the same as the 1960s, but I feel like it’s along the same vein of progressive or alternative lifestyles. Also, I just love how canted and off-balance this position is, yet to achieve this pose you must be rooted and firm in your stance. Anyway, I knew I wanted to frame her in a heart shape (because it was the Summer of Love –obviously). And daisies were an iconic flower of the time, so naturally a heart-shaped ring of daisies was only appropriate for the impact I was going for. Ok, so now I’m going to let you in on a little secret...I trace –my own artwork! I’ve been a freelance graphic designer for several years and my sense of composition works by arranging things on a page: nudging them a little to the left or to the right until they’re perfect, resizing different elements so they flow visually. For this piece, I wanted to use a few different daisy styles, but I wanted each repetition of that daisy to be identical. I’m most comfortable achieving this precision and symmetry on the computer. So I drew four different daisies, scanned them into my computer, arranged them into a heart-shaped ring in Photoshop, then printed out the heart to size and traced it onto paper. See? Precision! I don’t own a light box so I just tape my work to the window. It works great! Also –this piece is 9x14” so I just tape two pieces of printer paper together and cut it to size while I’m still working out the composition and trying out ideas. Tracing allows me to move elements in my composition around –kind of like in graphic design. 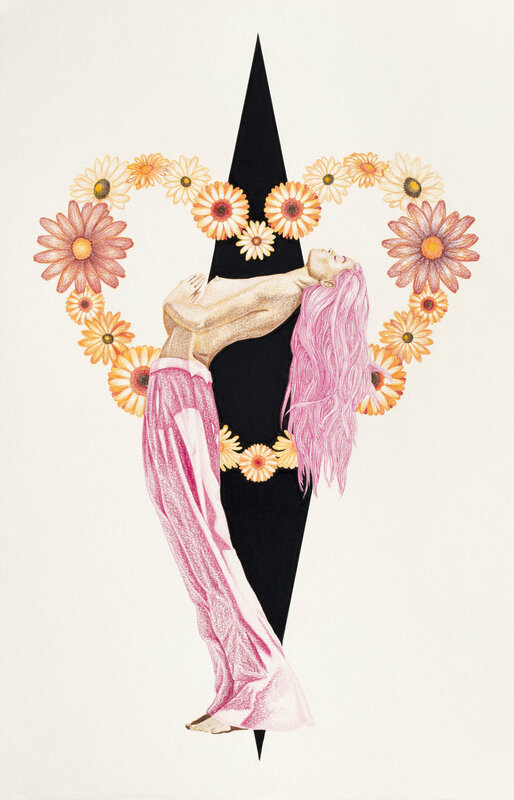 When I added the girl, I positioned her so she looked balanced within the flower heart. If I just drew her in, she might not be centered exactly the way I want. Once I’m happy with the composition, it’s time to ink it! I almost always ink my work, even if the final piece doesn’t use ink. Inking over the pencil lines helps me see the design better. If I find I don’t like something when it’s inked, I’ll re-trace the whole piece again to fix whatever it is I didn’t like. As for the coloring, I had just bought these two skin-toned Copic Markers so I was just to testing them out to see how they’d look. In the end I opted to use colored pencil only because ink wouldn’t achieve the softness and lightheartedness I wanted for the piece. My go-to brand of colored pencils is Prismacolor. 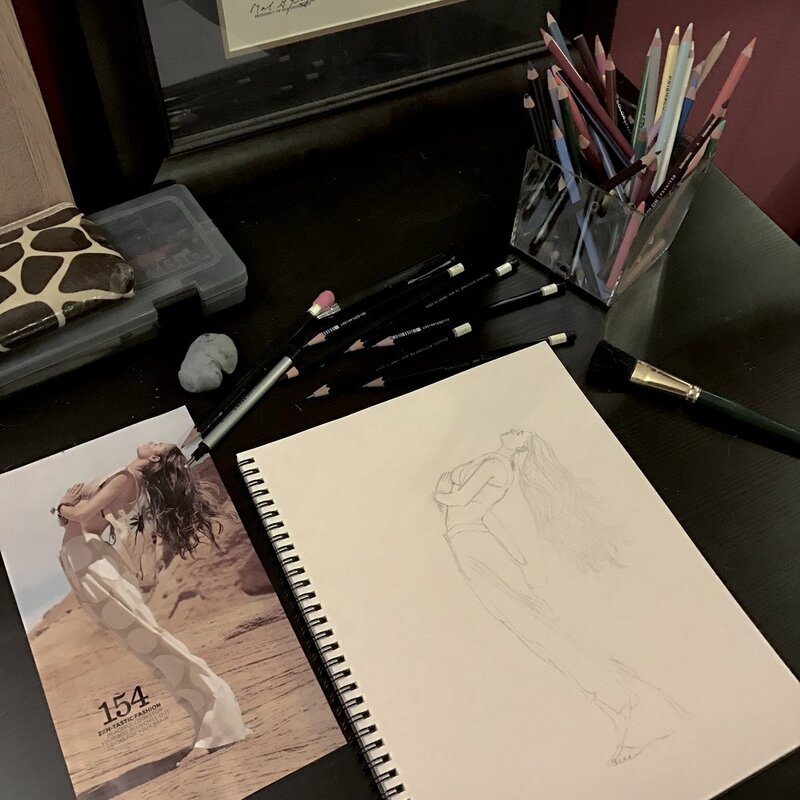 When I copy the composition onto the final paper –heavyweight drawing paper, is this case– I trace the outline using colored pencils. Then I begin to fill and shade. I always start with whatever part excites me the most. This time, it was the hair (it usually is). The whole time I was debating whether or not to color the background shape with colored pencil. In the end I decided to use Copic Markers in deep black to create more contrast. Because I knew the black ink would feel very heavy, I changed the shape to a diamond instead the originally planned triangle –just to keep the heavy black balanced with the bright colors. And there you have it!